The Boring Company has unveiled a proposal to build a 3.6-mile tunnel system under Los Angeles designed to transport commuters to the Dodgers Stadium. Dubbed as the “Dugout Loop,” the tunneling startup’s project aims to transport people to the stadium in under 4 minutes. The LA Dodgers Stadium is one of the city’s most prominent landmarks, where events such as games and concerts are held. The stadium in itself is massive, with a seating capacity of 56,000. Unfortunately for Los Angeles residents, getting to the Dodgers Stadium is nothing short of a traffic-inducing nightmare. During peak season, it is not rare to see vehicles being backed up for miles in seemingly unmoving traffic. This makes the travel time to the stadium, especially for commuters with their own cars, an unnecessarily long and aggravating affair. This makes the LA Dugout Loop the perfect project for the Boring Company, a tunneling startup conceived by SpaceX and Tesla CEO Elon Musk due to his experiences in traffic. The Boring Company is currently involved in several projects, the most prominent of which is the downtown Chicago-O’Hare high-speed transport system, which is expected to break ground as soon as its permits are completed. A test tunnel under SpaceX’s headquarters in Hawthorne is also nearing completion. 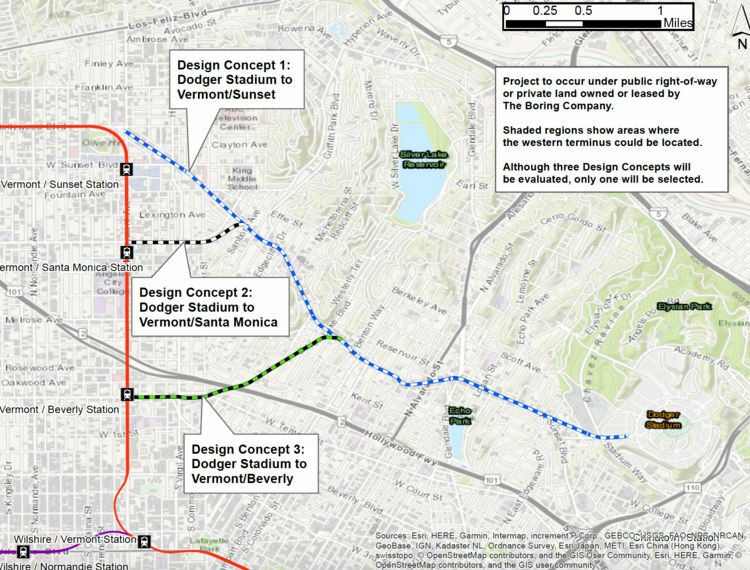 The 3.6-mile Dugout Loop will begin at the Dodger Stadium property and run under Vin Scully Avenue and Sunset Boulevard. The Boring Company has not announced the starting point of the tunnel system, but there are currently three options being explored. All of these options — Vermont/Sunset, Vermont/Santa Monica or Vermont/Beverly — are selected specifically to be close to Metro Red Line stations. The Los Angeles Bureau of Engineering (LABOE) has posted a document covering some of the finer details of Boring Company’s proposed project, including the design of the tunnels, how the electric pods in the Loop system will work, and the accessibility of the tunnels themselves. The document, which could be viewed in full here, notes that the Boring Company plans to use access shafts that would serve as tunnel access points for ventilation, emergency exit, and general access. These would be spaced approximately 0.5 miles apart, totaling about three to six locations located along the proposed Main Artery Tunnel alignment. The transport pods would be stored in parking spaces, parking garages, or car racks at Loop Lift locations. Lastly, the LABOE document also mentioned that initially, commuters who wish to use the Dugout Loop would book timeslots online or on the phone in advance. Initial operations of the tunnel system would be limited to around 1,400 people, but depending on community feedback, the tunneling startup could increase ridership to about 2,800 people per event. The ability to purchase tickets for the Dugout Loop onsite is also on the table. The Boring Company’s proposed tunnel to the Dodgers Stadium has gained the support of some of the city’s officials. In a statement to WIRED, LA Mayor Eric Garcetti described the project as a good example of the private and public sector working together. “It’s a great example of public-private partnership. We always reimagine the future in Los Angeles. We’ve always looked for new ways to move around,” the LA mayor said. Dodgers CFO Tucker Kain also expressed his support for the project, stating that the team is always supportive of novel ways to get fans to games in a more comfortable manner. “We were excited when the Boring Company came to us with this project. Whether it is flying overhead in an aerial transit system or bypassing traffic through an underground tunnel, we are always looking for innovative ways to make it easier for Dodgers fans to get to a game. We are committed to working with our neighbors and fans as the project moves forward,” Kain said in a statement to ABC7. Construction of the proposed tunnel project is estimated to take about 14 months to complete. The tunneling startup is making its proposal for the Dugout Loop available for public review from August 16 to September 17. A hearing will also be held at the Dodgers Stadium on August 28.